Cruise ships are floating hotels. And taking a cruise is like booking into a hotel for an extended stay. So what’s in a cruise? Instead of hotel rooms, you stay in cabins, or staterooms. They are usually small and have one window, or port hole. Newer and larger cruise shops have staterooms that are more like hotel rooms, with balconies or a sitting area and even larger windows. Standard affordable staterooms are generally about 150 sq feet in size, which are smallish but bearable. The single beds can be pushed together to form a double bed. Many ships bolt the beds to the floor so they don’t roll around and some cruises offer additional sleeping space in form of bunk beds that are attached to the wall. TV’s and en suite facilities are also available. All cruise ships have numerous public places usually on the deck level. These areas are usually spacious and expensively decorated giving the ship the feeling of luxury one associates with cruises. The closed decks offer areas for reading—including the ubiquitous lounge chair-and areas for watching TV or just lounging around. Spaces outdoors offer areas for playing games, pools of various sizes for swimming and sunbathing and gyms with all the latest workout equipment. And no cruise would be worth the money if it didn’t offer a choice of different restaurants and cafés, (some with internet connections), offering a plethora of desserts to delight even the most finicky of palates. It would surprise the first time cruiser that shopping aboard a cruise ship is a very positive experience. Most ships have duty free shops that offer at least as much and more than any good airport duty free shop. Credit cards are accepted as well as cash. 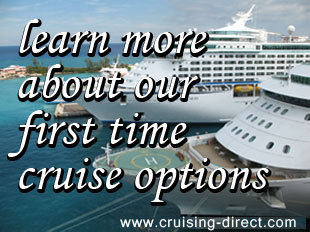 In fact, one of the easiest things about cruising is the convenience of being able to sign for all your expenses and have them charged to your account. One simply needs to register a credit card at the onset of the trip or put down a cash deposit and that’s it. Whenever a purchase is made onboard—drinks, side trips, massages–it is deducted from your account. And as at a hotel, an itemized receipt with all the charges is delivered to the cabin the night before disembarking. Cruise ships offer a variety of restaurants, cafes and snack bars, some quite formal. Babysitting services are usually available onboard and free entertainment is offered nightly. In addition to dining, many cruises offer entertainment such as casinos, nightclubs, Broadway style shows, talent shows and live bands. All but the gambling are free and are scheduled throughout the day and night. Daytime hours can be spent sunbathing, participating in bridge or poker games, bidding on various auctions and more. Some cruises even offer ice skating, bowling, movies and classes in computers, languages and more. There is so much to do aboard ship, that if you decide never to leave the ship, it would not be surprising. However, the ship does dock and you can then decide how much time you want to spend in the exotic and enticing locations you have chosen to visit. After all, if you never leave the ship, you might have well stayed home.